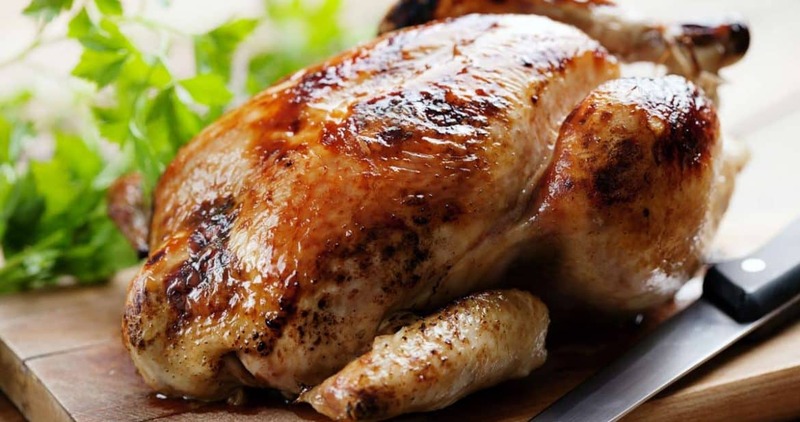 Roast chicken is a recipe that is prepared very frequently everywhere in Cuba. It is very easy to make and needs very few ingredients; just enough to give a delicious flavor to the chicken so that it can be enjoyed at home. It is an ideal dish for those days when you are expecting visitors, since it is a light dish, tasty and can be served with anything. Before we start the preparation of this dish, we recommend that you to take a look at the pieces of advice we give that may be helpful for this and other recipes. The first thing we must do is select the size of the chicken we are going to cook, because if we do not have a whole chicken we can simply use portions of one. The result will be equally delicious. You should take in consideration that cooking the chicken this way will have less calories than if you fry it or cook it using other methods. The first secret to get it perfect is to defrost it completely at room temperature before the marinade; this way the flavor is absorbed better by the meat. Also, it is advisable to let it sit for a few minutes after being marinated in order to absorb the flavor better and make the meat even more delicious. After that, we roast it at medium temperature- not too high, not too low. This is so that it can be cooked very well from the inside out and so it gets juicy and golden without being burnt. In this recipe, we use a small chicken (1.5 kg); the cook-time will depend on the size of the chicken, so a bigger chicken will take longer roast. If you use our suggested portions, the cook-time should be lower, so it won’t be as necessary to pay too much attention to avoid burning the chicken. Our Cuban roast chicken recipe, a homemade easy-to-make preparation, is very tasty and irresistible to make. A perfect dish to enjoy with family and friends. First, we prepare the seasoning. Crush the garlic cloves and put them in a small bowl, add lemon juice, vinegar, parsley, thyme, pepper and salt. Mix everything together. Set the bowl with seasoning aside. Put the chicken in a container to marinate it. Prick the chicken with a knife to make several holes so the seasoning can get inside the chicken. Spread the seasoning all over the chicken, including in the holes., and let it sit while we get the oven ready. Check to make sure there is an adequate amount of salt. Some ovens come with a rotisserie spit that spins as it cooks so that the meat is roasted evenly. If you have this type of oven, you just need to place the chicken on the rotisserie and cook it at 180° for approximately an hour and a half (if it is a small chicken), or until the skin is completely golden. On the other hand, if you don’t have a rotisserie, put the chicken on an oven tray in the oven, preferably on the lower level if it is a small oven, and cook it evenly from top to bottom without ventilation for an hour until it is golden. Then, turn it around so that the other side cooks as well. 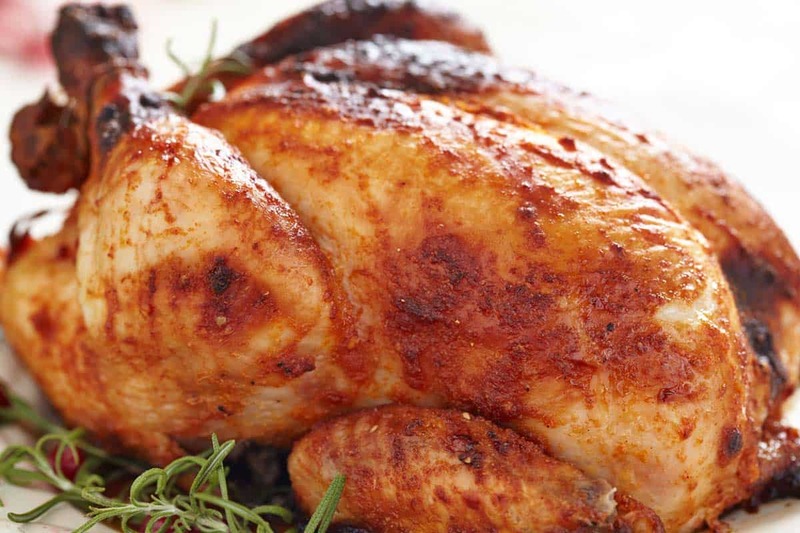 Take the chicken out of the oven and serve it with rice, a salad, fried food, or any other side dish you would like. We very much enjoy adding paprika to the seasoning, as it gives it a special taste... If you’d like, you can add other spices such as cumin, bay leaf and oregano. It depends on your preferences. To get the breast juicy and tasty, spread butter between the skin and the meat; the result will be incredibly delicious.